Seriously, just bookmark it so you won't forget where you found these great resume examples for free. Then at least help out your friends by telling them about us. For downloading--just click save--then save in Desktop--- same file name I have or choose your own file name. It just makes it easy to locate later when it is saved to your desktop. You never know where the computer is going to send it. Could be anywhere, and you don't want to have to search for it, so the desktop is always the best place to put it. This website is free so add this website to your bookmarks. I like the formatted look to all of these examples. They just have the look of a look of hire me, number 2 has no background effect, and number 3 has the background added. I think the background makes this example look special, the person going through the stack of resumes will find this one with the background very eye catching. When you first glance at it, your skills are very obvious, and I am sure for this job position, with the background added that it will end up in the call in for an interview column. 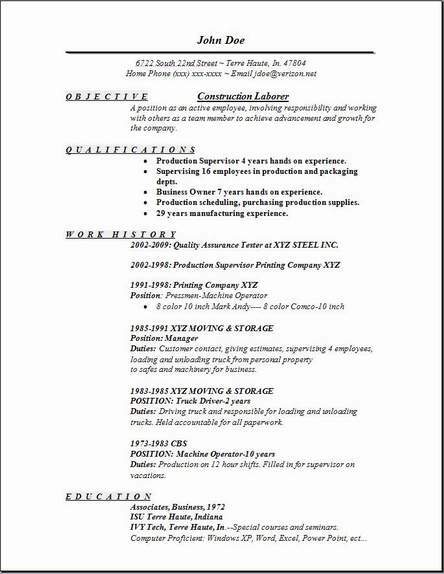 Once you edit this resume with your own information, you want your end result to be satisfaction. Your approval of the resume you choose is what counts to me. I hope you find all these examples really useful. I also hope you get the job. Don't forget to tell your friends about this website. The construction resume above was a new addition and I hope you like the background effect on number 3. You could always change it if you have a different picture you might like better that the one I put on there. Most people like background effects, I know I do, and I added them here so you would have a different option available to you. If you decide on downloading the construction resume with the background effect, then drop me a comment back on the contact us page. Your comments really matter in helping me decide what to add to this website next to assist people gathering what they need for their job application process. Good luck to all of you who are looking for a job in construction. Use my job search engine to look for jobs. 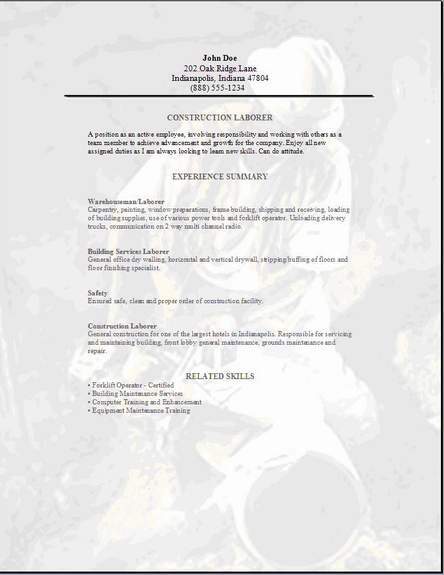 Then send in that new construction laborer resume you just made from this site. Don't forget to send your friends back here to help them find what they need for their resume. Cover letter is at the top of the page.